These days, fiction can hardly keep up with real life. 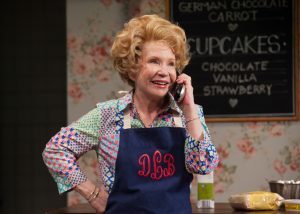 Take The Cake, playing at Barrington Stage Company in Pittsfield through July 15. It opened last month, just days after the Supreme Court upheld a Colorado baker’s refusal, on religious grounds, to make a wedding cake for a gay couple. Bekah Brunstetter’s play concerns another baker, who likewise declines to make such a cake for another such couple. It handles this hot-button topic not with outrage but with humor. It’s laugh-out-loud funny, a scrumptious confection with a whip-smart icing, richly layered with complexity and compassion. This cake-maker is no litigious absolutist, and her scriptural scruples provoke not a lawsuit but a life-changing crisis of conscience. Della is an open-hearted woman and a kind of godmother to Jen, the daughter of her dear departed best friend. When Jen comes back to her North Carolina hometown to get married, she goes to the bakery with Macy, her betrothed, to order the wedding cake she’s always dreamed of. And Della faces a dilemma. Macy, by the way, is black – and that really is a “by the way.” This church-going white lady’s qualms aren’t because Jen is marrying a black person, but because she’s marrying a female person. 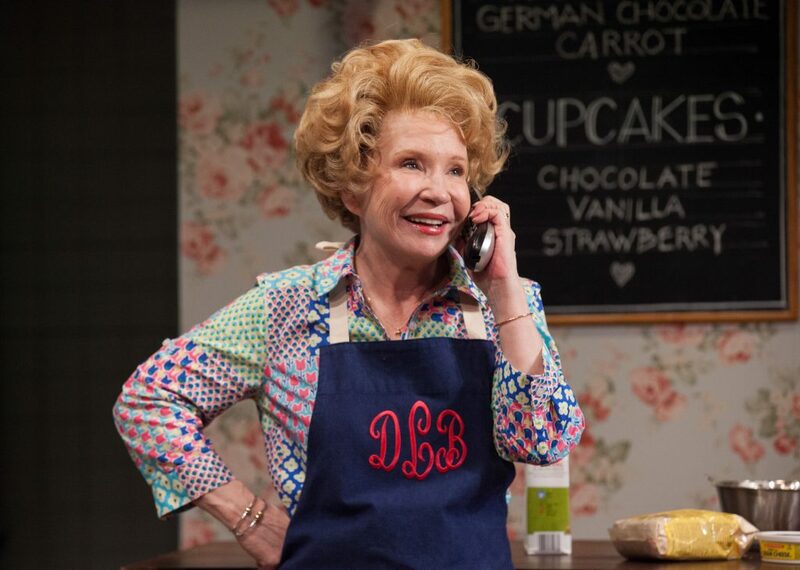 Della is played by Debra Jo Rupp, the TV star and part-time Berkshire resident who has become a popular figure on area stages (this is her seventh Barrington appearance). 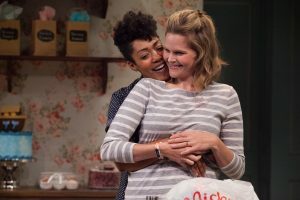 Rupp originated the role when The Cake premiered last year in LA, where it was directed by Jennifer Chambers, who also helms this near-perfect production. And she is perfectly marvelous. She wraps her trademark nasal chirp, perky energy, and comic flair into a multilayered portrayal of convincing depth. 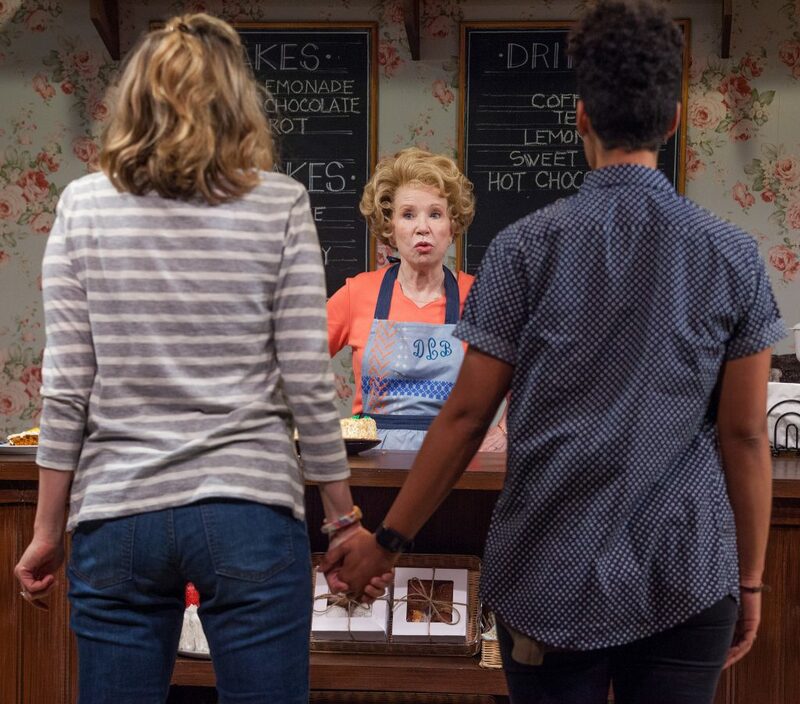 Her supporting players are equally supple, both hilarious and moving, and perfectly cast. In the course of the play, all four characters have to face their own preconceptions and assumptions, and balance cherished notions against the give-and-take of human relationships. Jen is torn between her conservative Southern upbringing and her present Brooklyn-based lifestyle. Virginia Vale brings that struggle to Jen’s different ways of being with these two women she loves. She giggles and jokes with Della, and bares her conflicted heart to Macy. Then there’s Della’s husband, Tim, who takes his given circumstances for granted – and that includes his wife. Douglas Rees gives the rough-edged good ol’ boy a nonchalant confidence that amusingly totters when Della’s soul-searching moves into the bedroom. In Della’s cake-making philosophy, there can be no skimping on ingredients or cutting corners. (She applies the same rule to her morality, though the biblical injunction against homosexuality bumps uncomfortably against her generous spirit.) She unabashedly advocates for the pleasures of fat and sugar, and this pleasure-positive outlook eventually extends to her marriage as well. A couple of scenes touching on marital relations are as poignant as they are side-splitting. Tricia Barasamian’s costumes point up the North/South sartorial divide, and Tim Mackabee’s double-revolving set neatly shuttles the action between the bakery and two bedrooms. Lighting and sound designers Matthew Richards and Alexander Sovronsky animate Della’s anxious fantasies about a TV baking competition she has entered, as she finds herself pinned in a spotlight and quizzed in voice-over by an increasingly belligerent host. Notions of “tradition” pervade the play, from Della’s strict observance of time-honored cake-making rules to get “the taste of time and obedience,” to Jen’s lifelong dream of a classic fairytale wedding, to the conventional notions of marriage and family that are tested for every character. Brunstetter is a writer and producer for the hit TV series This Is Us, and her script is just as playful, surprising, and heartfelt as that show. She has said that The Cake’s culture clash is based in part on her own Southern upbringing, and a lot of the laughs draw on that collision. The ending is satisfyingly tentative – hearts are mended and things are changing, but there’s work still to do. And meanwhile, there’s cake.